JNN 23 July 2014 Baghdad : On Sunday, the terrorist organization of the Islamic state in Iraq and the Levant, has taken responsibility for the bombings that hit yesterday different parts of the capital, Baghdad, pointing out that the suicide bombers who carried out two bombings, one is German and the other is Syrian nationality. The organization of ISIL said, in a statement posted on the sites belonging to ISIL on the Internet, that ” two suicide bombers who carried out the bombings; they are Abu Qaaqaa of Germany and Abu Abdul-Rahman al-Shami,” their names indicate that they are from Germany and Syria. Yesterday bombings are the deadliest in Baghdad since the start of the attack in the northern city of Mosul then its expansion across other areas. 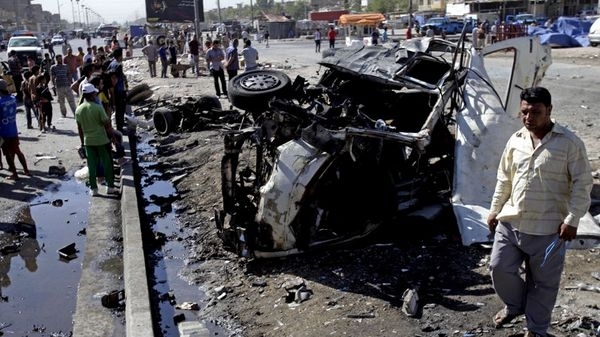 On Saturday (July 19, 2014),the capital, Baghdad, has seen a series of car bombs, resulted the killing of 11 people and the injuring of 53 others, according to the Ministry of the Interior. This entry was posted in Iraq News, Middle East and tagged Abu Abdul-Rahman al-Shami, Abu Qaaqaa, Baghdad, German Suicide Bomber, ISIL Terrorists, ISIS, suicide blasts, suicide bombers, Syrian Suicide Bomber. Bookmark the permalink.